This month's challenge is to use our favorite new or returning colors from the Color Fresh. 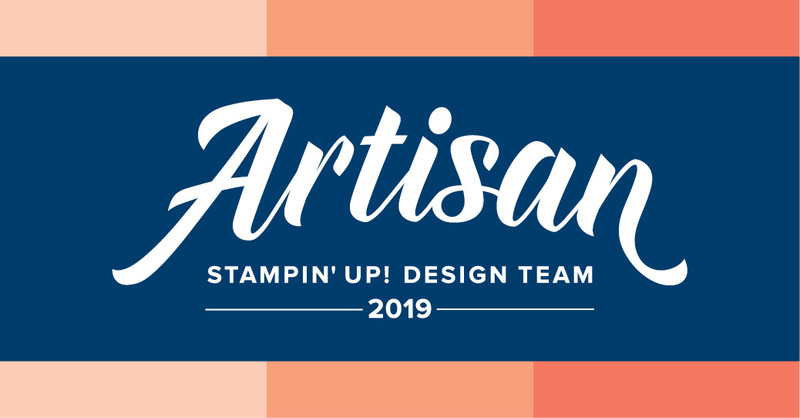 With so many gorgeous new and returning colors to choose from, I know this is going to be a fun challenge! For my card today, I chose returning colors Coastal Cabana and Mint Macaron, along with the brand new Balmy Blue and Soft Sea Foam. So, funny story about my favorite color choice: I fell in love with the returning color Coastal Cabana after it had been freshly retired. I started as a demonstrator about two years ago, just after the fabulous Coastal Cabana had retired as an In Color. Yet this color could not seem to be forgotten. 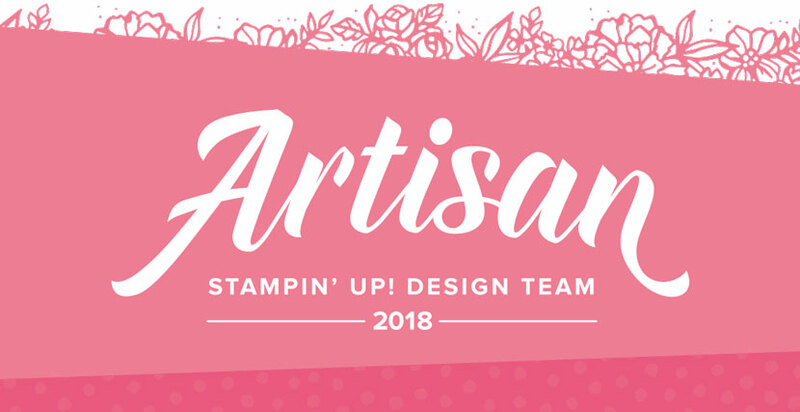 I'll admit that I was a little heartbroken after discovering it at the point when it could no longer be purchased from Stampin' Up!. Well, I'm sure you can imagine just how happy I am that it has officially joined the Brights Family core colors! Now for my card. 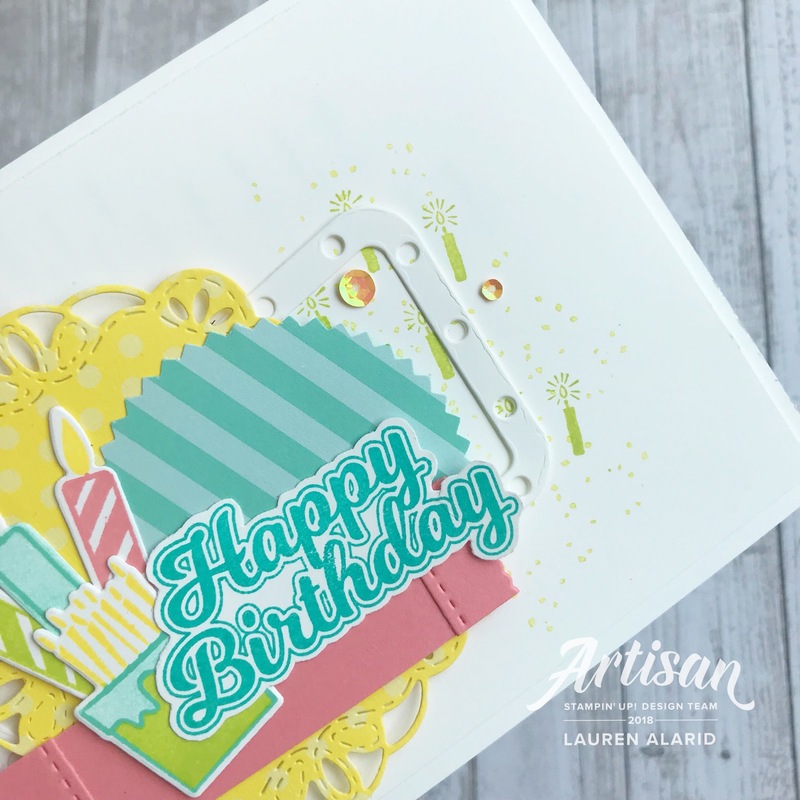 For this fun color combo, I'm featuring the Broadway Birthday Bundle. 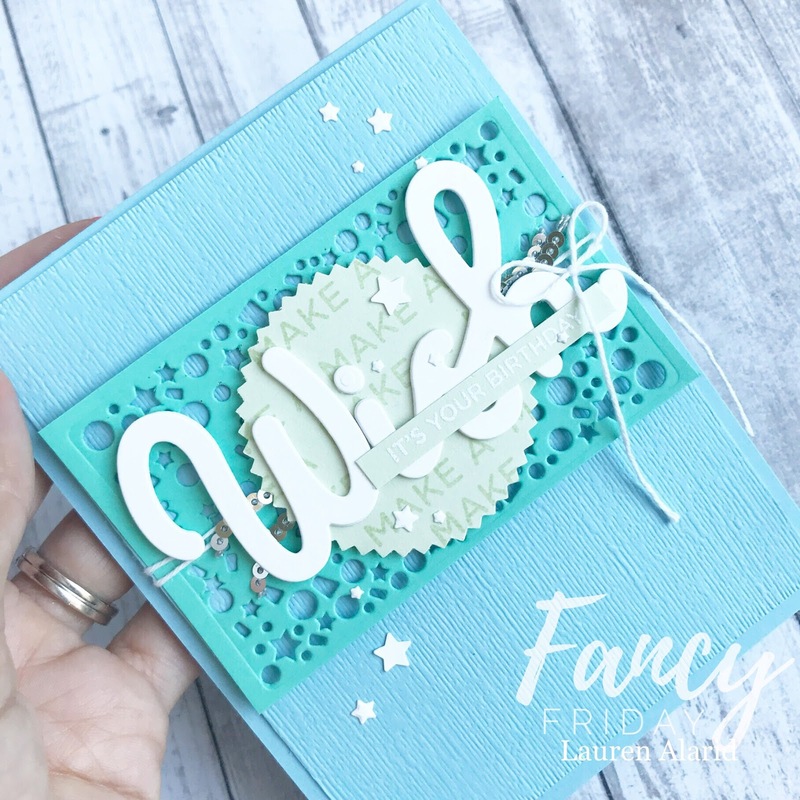 I thought these colors together looked so happy and fun so I figured that they would be great for a birthday card, so this set was perfect!I used the beautifully scripty "wish" word die from the set and cut it from Whisper White Cardstock. 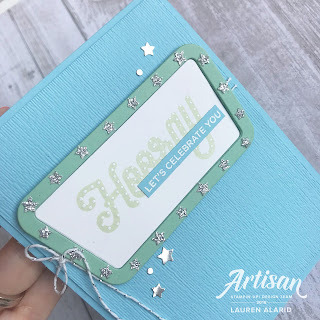 To create that fun confetti panel, I took a 2 1/2" x 4" piece of Coastal Cabana Cardstock and used the Candles and Confetti Framelits Dies and ran it through my Big Shot (once with the die on the top half and then again with the die on the bottom half of the cardstock) to create this fun confetti layer (see photo below). Don't worry about the overlap in the center. 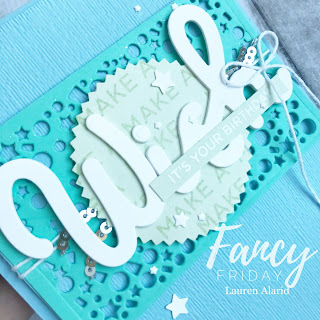 It's practically unnoticeable with the "wish" die cut layered on top. 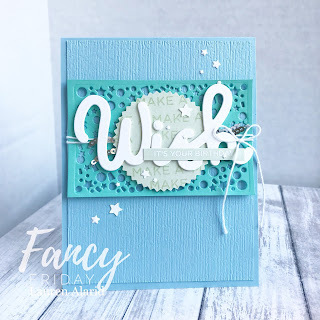 I also used that same confetti die to cut some white stars to scatter on my card. For my base and top panel, I used Balmy Blue Cardstock. 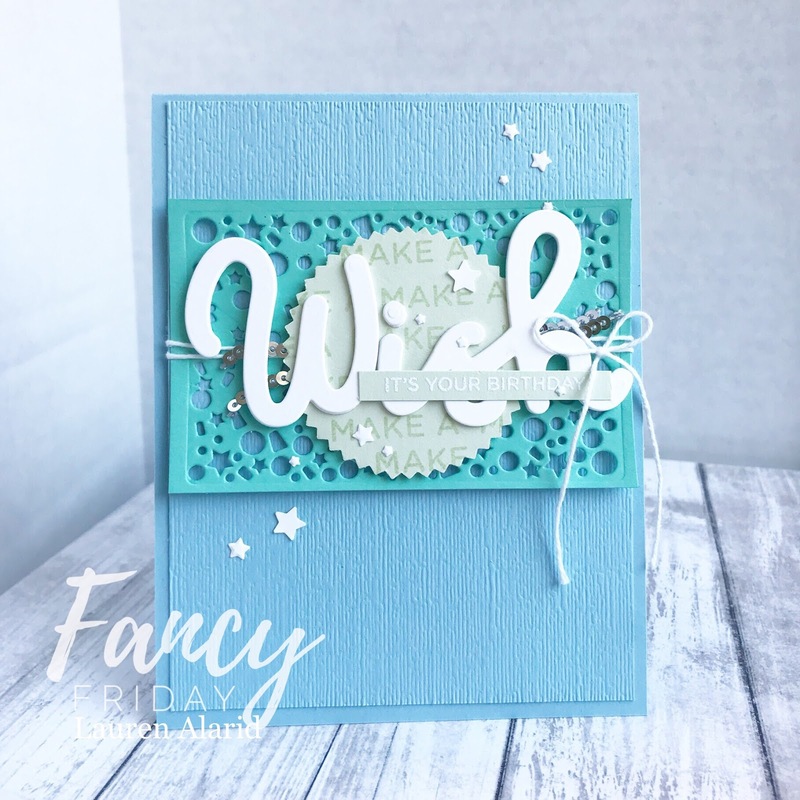 I wanted a little bit of texture so I used the Subtle Dynamic Textured Impressions Embossing Folder, which adds just the perfect amount! Next, I used Soft Sea Foam Ink to stamp "Make a" repeatedly all over a circle that was punched using the Starburst Punch. To finish off my card, I added some Silver Mini Sequin Trim. I hope You have enjoyed my card for today and don't forget to keep hopping for more inspiration. Up next on the hop is the lovely and talented Rochelle Blok. I look forward to seeing what gorgeous creations she has designed with her favorite colors! Hey peaches! I'm posting to you (kind of) from Disneyland! Yes! I'm in one of my favorite vacation places and I'm so blessed to be able to take these unforgettable trips with my family. You may even see a few photos posted on my Instagram account (@lalipeach). This is another great way to follow me and all of that great crafty goodness you know and love! Well, on to today's card. 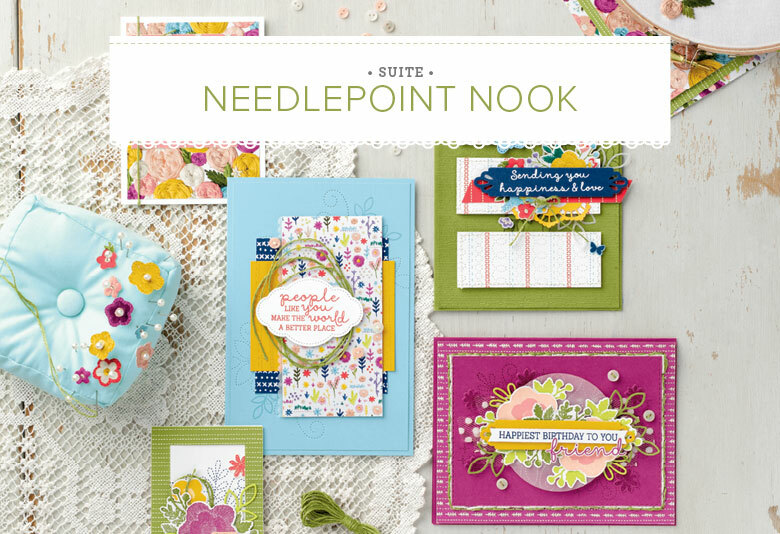 I have been having so much fun playing with the new products from the brand new catalog! 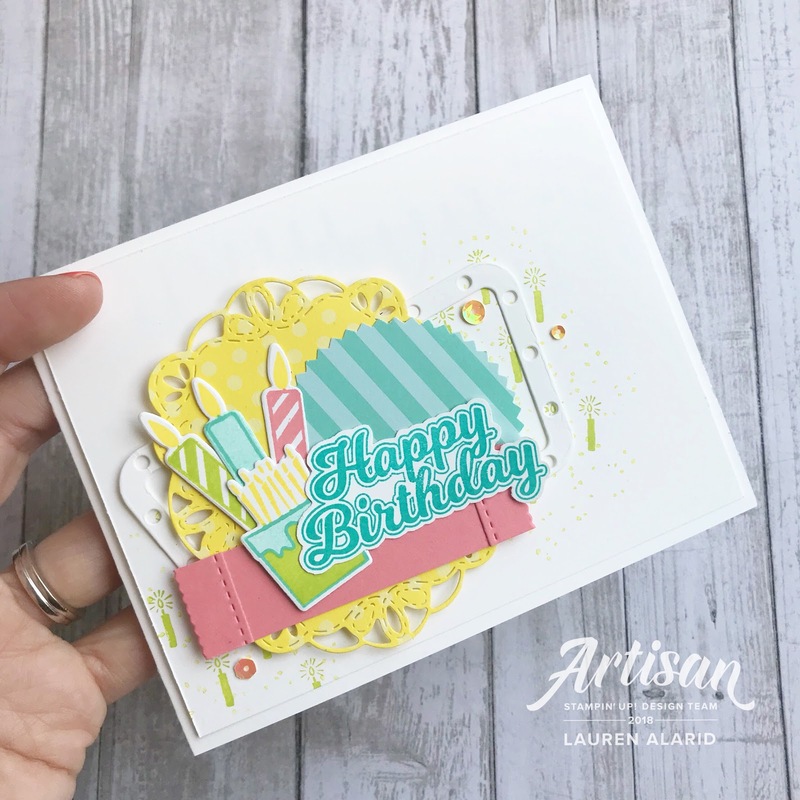 One of my new fast favorites is the Blow Out The Candles Bundle. This set is so fun and perfect for any celebration. I think one of my favorite things from this set is the fun confetti die. Though I did not use it in today's card, rest assured that I will be using it quite a bit in the future. You can also see it in action in my next upcoming blog post so keep an eye out for that! I started with a base of Whisper White Cardstock. I wanted a playful stamped background so I used the Birthday Backgrounds Stamp Set and stamped a few of the images randomly in Lemon Lime Twist Ink. Hint: I cut apart one of the candles from this set so that I had the freedom to stamp individual candles where I wanted them. To finish off my card, I added a few sequins from the Iridescent Sequin Assortment. Thanks so much for stopping by! I'll see you next post! It's here! 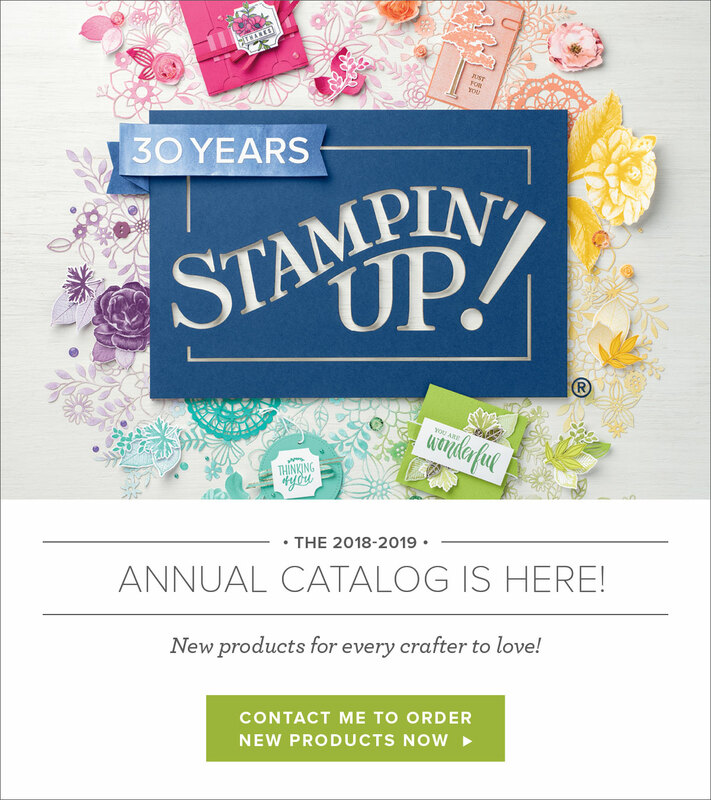 The brand new 2018-2019 Annual Catalog is now live! Click here to see it. 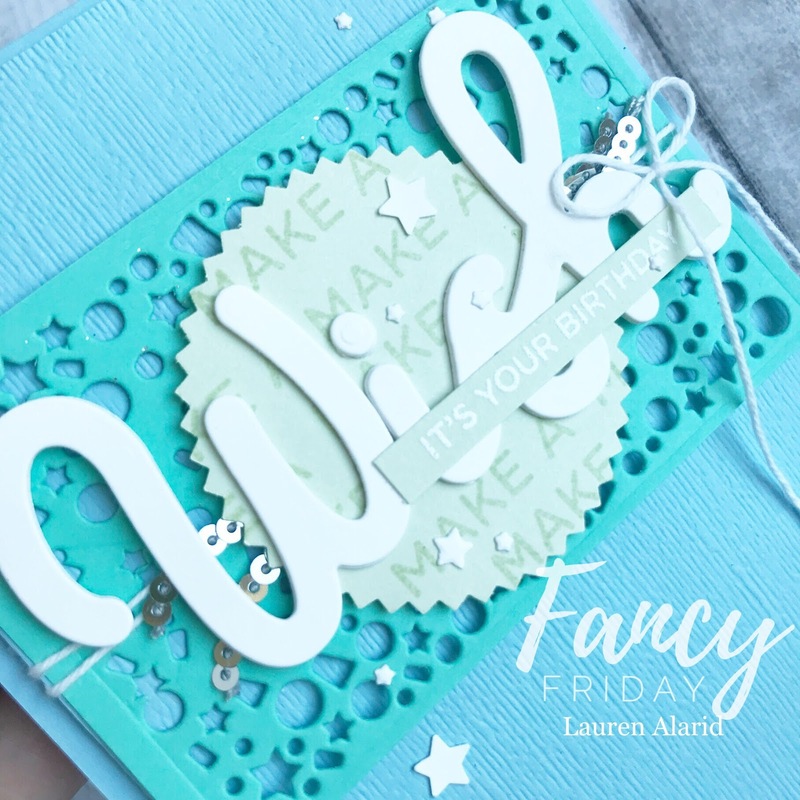 I'm back again, peaches, with a brand new card featuring products from the amazingly fun and party-rific Broadway Bound Suite of Products. If you're looking for a way to make your celebration to have that "wow" factor, look no further! This suite has it all! I can already tell that I will have no problem coming up with endless projects with these fun new products. 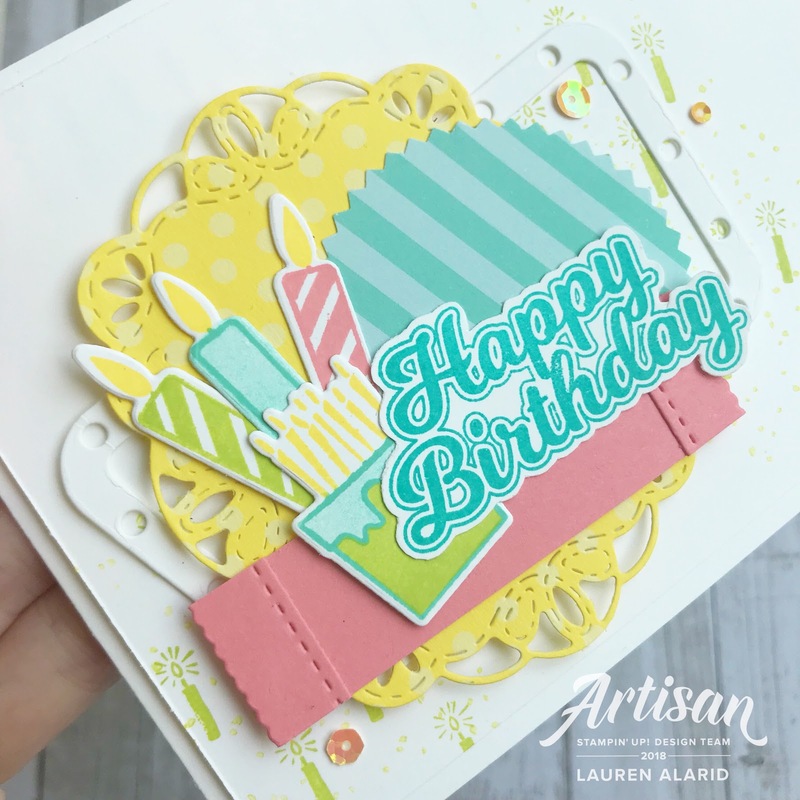 Now this suite features colors that are both bright and showstopping, but I wanted a softer look for today's card. 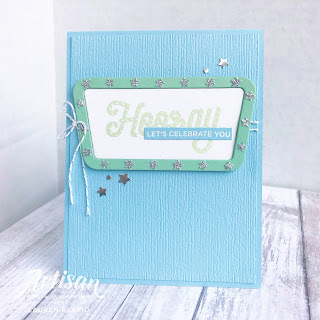 I started by using the "horray' stamp from the Broadway Birthday Bundle to stamp in Soft Sea Foam Ink. After allowing it to dry, I layered on the dotted stamp and embossed in white. You see one of the cool things about this set is that there are a few layering stamps for the words so that you can get that marquee look. I love it! For the base I used the Subtle Dynamic Textured Impressions Embossing Folder with Balmy Blue Cardstock to create a textured background. For the fun effect of the silver glitter stars, I used a few die cut stars by cutting them from Silver Glimmer Paper, using the Candles and Confetti Framelits Dies. I adhered them wherever there was a hole in the marquee banner.I just love this set and think it offers so many possibilities. You really will have to try it out for yourself! Well, That's my card for today! Thanks so much for stopping by! I'll see you next post! Hey peaches! 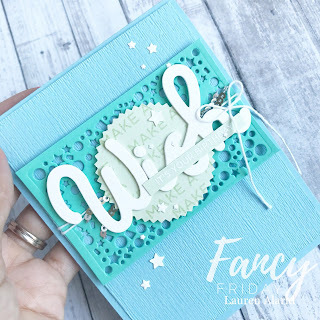 I have a lovely card to share with you today that uses a fun technique. It's not new to me but I'd thought I'd share it again since it has been while and there may be a few of you who haven't seen/tried it before. This technique has a sort of a gilding effect. I love it's subtle look with just the right amount of shine. In my card today I will be featuring the Rooted In Nature Bundle. I think this set will highlight this technique beautifully. To begin though, I'll start by explaining how I built up my layers and then I'll show you the technique at the end. For my embossed circle layer I used Crumb Cake Cardstock. 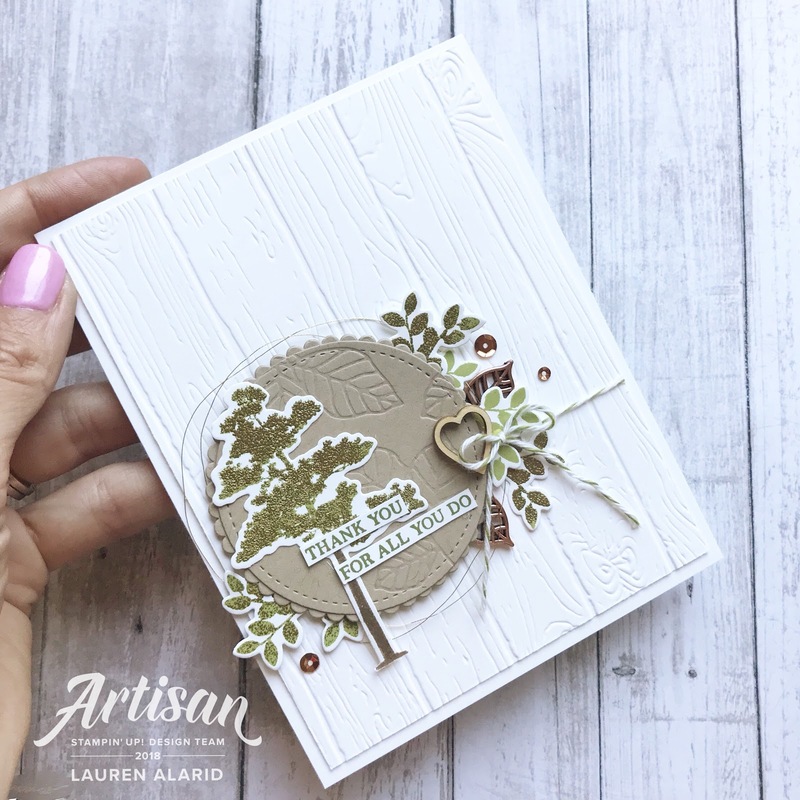 I used my Big Shot and the brand new Embossing Mats, along with the leaf die from the set, to create the subtle embossed background on the circle. I just love the look of this! Next, stamped a few leaves in Old Olive Ink and cut them out to be layered behind the circle layer. Now for the gilded embossing technique. 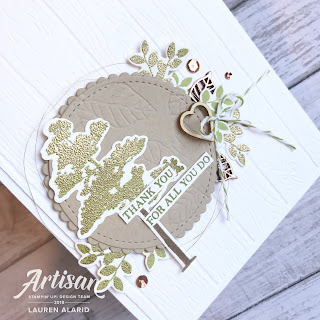 To achieve this look I took the tree stamp from the set and stamped in Old Olive Ink. I gave it about two seconds to start to dry before sprinkling Gold Embossing Powder onto it. The areas of stamped ink that were still wet will grab a hold of the powder while the dry ink will not. You then melt the powder and you are left with a really cool effect. I did this same technique with some of the leaves layered behind the circle. You can experiment with the timing and get a more concentrated gilding effect and a lesser one, depending on how long you wait to add your powder. I definitely recommend trying it for yourself. To finish off my card, I dded some of those gorgeous new Leaves Trinkets. Thanks so much for stopping by! I 'll see you next post!